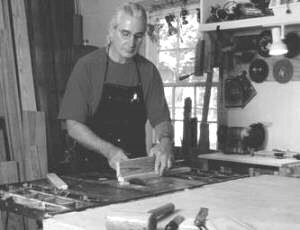 Ron Siebler is a 5th generation craftsman who continues the family's longstanding traditions of woodworking and blacksmithing. His father, Harold Siebler (b. 1919 - d 2015)), grew up working as a mechanic with his dad, Albert. He also spent time in his grandfather's blacksmith shop. With the outbreak of WWII, Harold became an aircraft maintenance officer, and subsequently, an Instructor with the Air Force. Albert Siebler (1894-1954), Ron’s grandfather, started his career as a blacksmith in William's shop, and then became a successful auto-mechanic with Siebler's Service Garage in Loop City, Nebraska. 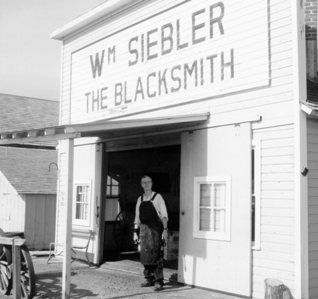 Siebler’s great-grandfather, William Siebler (1868-1954), apprenticed as both a blacksmith and farrier in Germany. In 1887, William immigrated to Cornlea, Nebraska, where he opened the town's first blacksmith and wagon shop. 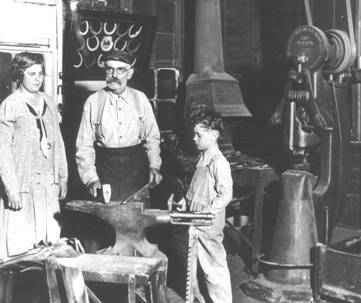 In 1912, William moved his blacksmith shop to Aurora, Nebraska. Ron's great-great grandfather, Friedric Siebler (1840-1875), was a wheelwright and wagon maker in the village of Nöttingen, Germany. All five generations have been practitioners in the art of woodworking. For even more family information, visit The Siebler Family History Project. youngest daughter, Mildred, and youngest son, Lee. Stuhr Museum, Grand Island, Nebraska. Ron Siebler in his Dallas workshop. 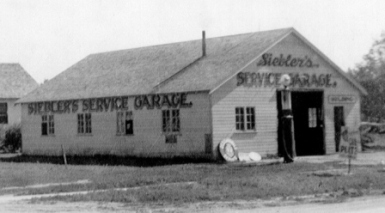 Albert Siebler's Service Garage, Loup City, Nebraska.